This came to us from our good friends at LegalArt. This is a great opportunity to network and learn about ways you can get your work displayed in the public libraries. Recommended. Public libraries were Miamiâ€™s original alternative exhibition spaces. Since the 1960s, local, national and international artists and curators have worked with the Miami-Dade Public Library System. Public libraries are well-used civic and community spaces. As the context for art and exhibitions, libraries can challenge artists to experiment and think about their work in new and different ways. The Miami-Dade Public Library System accepts proposals for exhibitions, performance art and site-specific installations in all media. Its exhibition program includes contemporary art, material culture, folk art and art education (for example, exhibitions of student work organized by teachers or other educators), as well as exhibitions in the humanities about literary, historical, cultural, and interdisciplinary topics. As Library Curator, Denise Delgado oversees the Art Services and Exhibitions Department at MDPLS, manages an exhibition program for the 48-branch system, develops public programs, acquires new work for the Libraryâ€™s permanent art collection, and oversees its care and management. At this SeminArt, weâ€™ll talk about the opportunities and resources available to artists through MDPLS, the upcoming Call for Proposals (deadline: March 10), the exhibition process, and more. Denise will be available for specific questions at the end of the program. 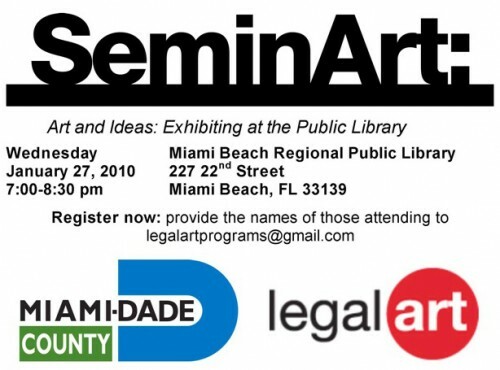 Stick around to meet other artists and community leadersâ€”LegalArt SeminArts are great networking opportunities!